The Russian government has allocated some 1.32 billion rubles (US$0.02 billion) to the United Aircraft Corporation (UAC), the company which is responsible for the passenger re-launch of the Ilyushin IL-96-400M, four-engined wide-body aircraft, according to a July 26 official notification posted on the government website. The financial injection will boost the registered capital of Voronezh Aircraft Production Association (part of UAC, but generally known by its Russian acronym VASO), the producer of the aircraft. The funds will focus on the construction of a new 1,055-square metre facility as well as on the thorough modernisation of the manufacturer’s capabilities. The project, which is scheduled to become operational in 2020, requires a total investment of 1.47 billion rubles. 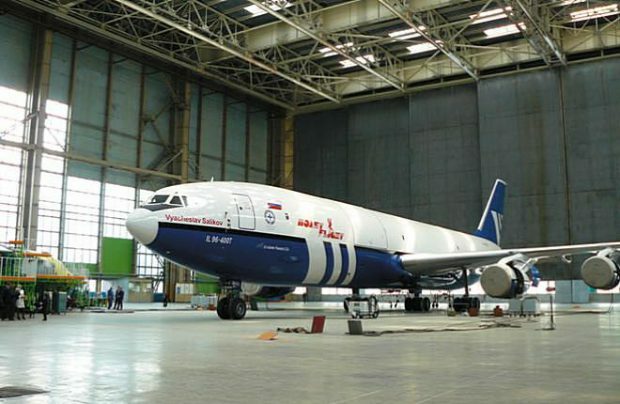 Experts point out that the IL-96 aircraft itself is not the target, as the producer has not received any orders for the type from commercial operators, but is instead aimed at preserving and developing the all-round competences of VASO, for which the IL-96 is the main focus. The facility also participates in other UAC programmes such as the MC-21 advanced narrow-body, Sukhoi Superjet 100 (SSJ100) regional jet; the IL-114-300 upgraded regional turboprop; and the Ilyushin IL-76MD-90A transport aircraft. Maintaining and upgrading such production capabilities is part of the political strategy of preserving Russia’s independence from the west in view of the economic sanctions. The IL-96-400M is a 390-seat passenger version of the IL-96-400T cargo aircraft. The modernisation project was launched in 2016 and its first flight is scheduled for 2019. The type’s PA-90A1 powerplant is being supplied by UEC-Perm Motors (part of United Engine Corporation) before the end of this year. The government is to invest a total of some 50 billion rubles in this IL-96 programme, with 5.995 billion already spent (3.595 billion in 2017). A further 4.5 billion rubles is expected to stem from UAC. According to Yuriy Slyusar, head of UAC, the Il-96 is the programme that “defines the viability of VASO.” The corporation is currently gearing up for the launch production of the modernised passenger version of the aircraft. Experts do not anticipate that this rejuvenation programme will ever achieve break-even because its primary goal is to preserve Russia’s expertise in manufacturing wide-body aircraft. The plan is to produce between six and eight IL-96-400Ms, with deliveries scheduled between 2021 and 2024. The project is being financed through State Transport Leasing Corporation (GTLK), which will receive additional funds for the purpose.